First, you need to cover a working surface with newspaper, and your body with a nice apron. 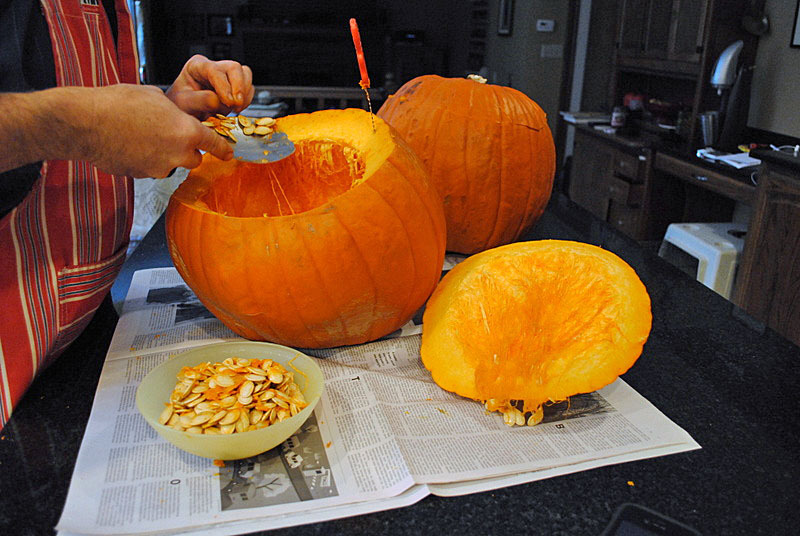 Then cut open a lid on the top of your pumpkin, and scoop out all the seeds and the fibers that glue them together. Reserve them for later. 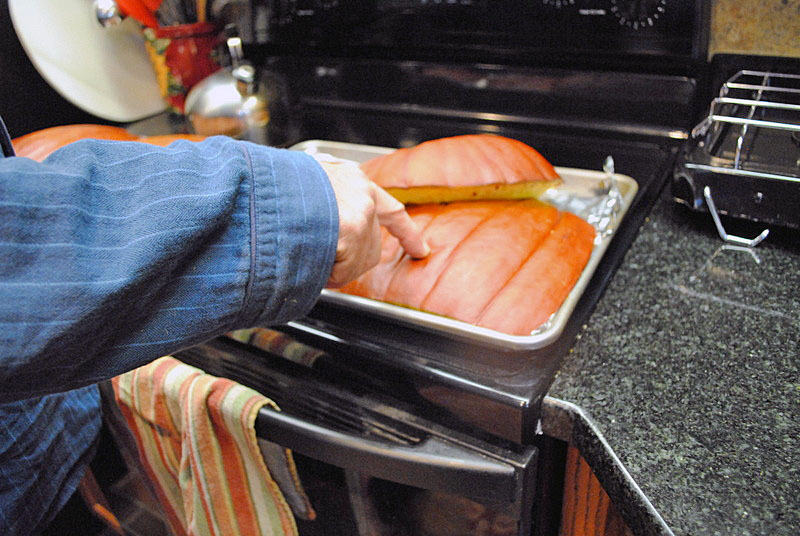 Next, cut large slices that will fit over baking sheets, and place them in a 350 F oven, with the cut side down. No need for salt, no need for oil. Easy as pie. 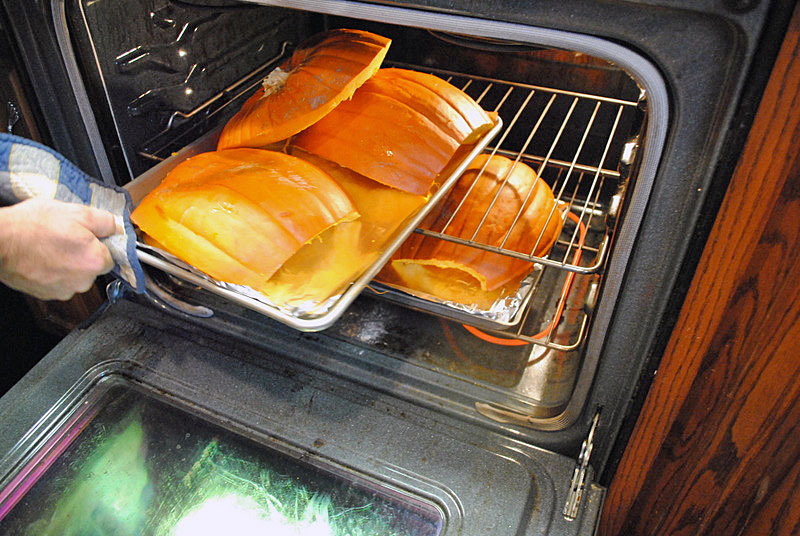 Bake the pumpkin for about 1 hour, or until soft. A good test is pushing your finger lightly on the skin, it should form an indentation. Now, let the fun begin! 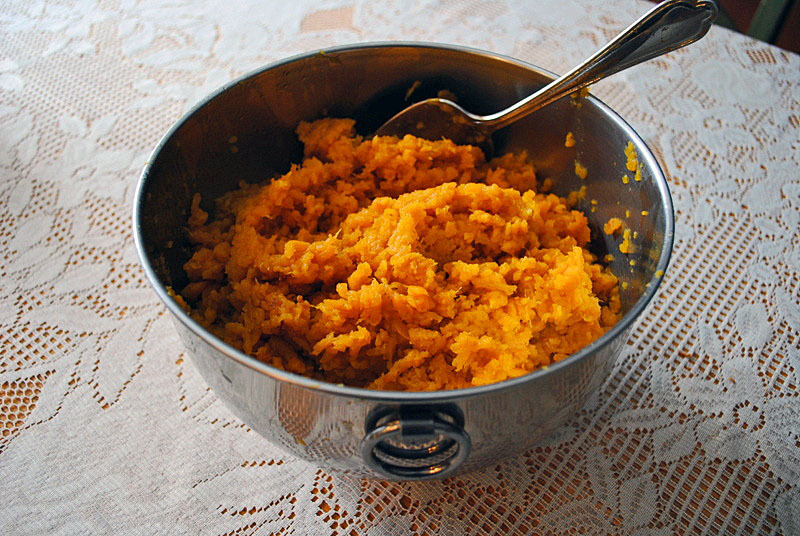 Scrape the flesh into a bowl, and go to the sink, carrying the cooked pumpkin, an empty bowl, and a potato ricer. Place some of the pulp in the masher, and squeeze out with a light pressure, just to release what is mostly water. Let that go down the drain. 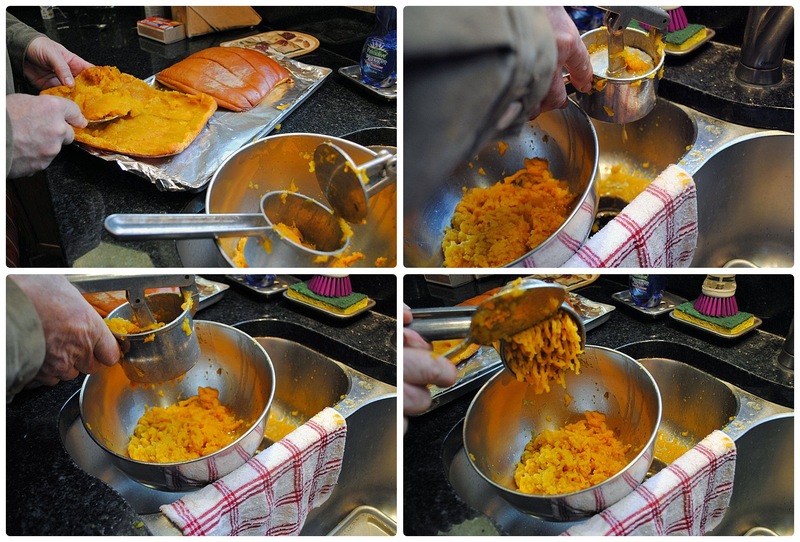 Once you feel most of the watery stuff is released, puree the pulp into the clean, empty bowl. Do that in batches until all the pulp is passed through the holes of the ricer. And save the rest in the freezer. I normally make a few 1-cup and some larger portions. Make sure to label, because the freezer can quickly turn into a parallel universe, unknown and mysterious. I always make me oown puree and have never bought the canned version. 😉 Homemade puree tastes a lot better. I lived on a farm for many years and always made puree. So much better than canned. 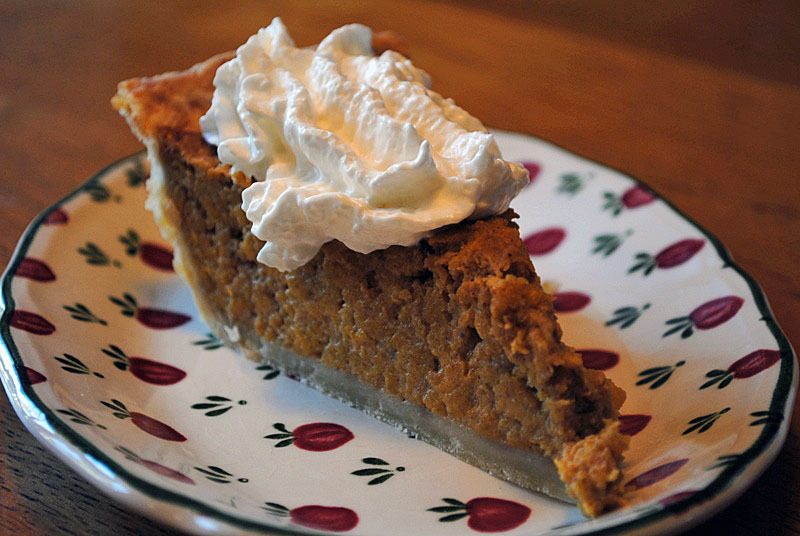 A hint… The choice of pumpkin makes a huge difference in yield. I’ve always thought of the pumpkins you have pictured as “Halloween” pumpkins, good for face carving but the yield of pulp is low. Field pumpkins, the ones that are flatter and frosted almost pink, yield far more pulp. Even better are the flat, deeply ridged pumpkins that people often use for decoration. The flesh in those is 2″ to 3″ thick and delicious! I’ve tried this a few times and now see I may not have allowed anough water to drain away! Plus the ricer is a great tip!! I’ve not seen any pumpkins around here but if I do I can’t wait to try this…and all your recipes!! I have no idea, big pumpkin is edible. Will definitely do this next time. Thanks Sally, or, shall I say, thanks Phil? I’ve tried to ‘like’ pumpkin but it seems to be an innate not an acquired taste. Even the cheesecake I made and posted ended up being given away to more appreciative palates. 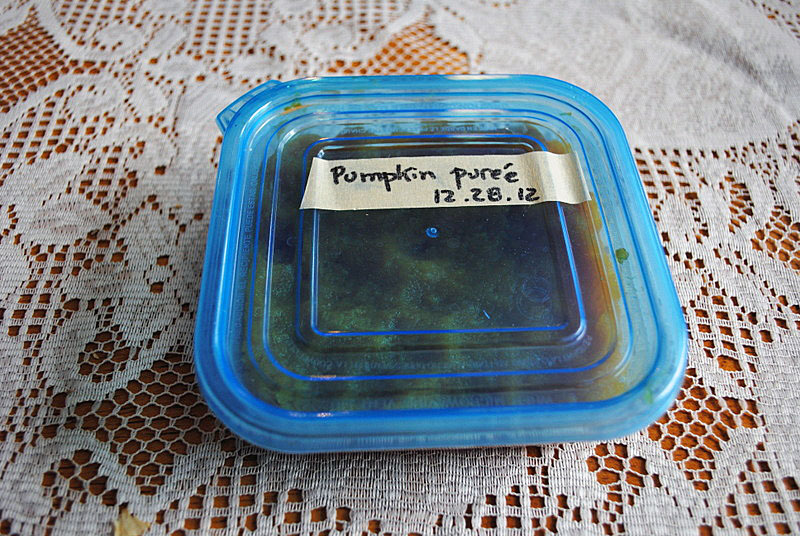 I still have 2 cups of canned pumpkin puree in my freezer ( I laughed when I read “the freezer can quickly turn into a parallel universe, unknown and mysterious” as it’s SO true) looking for an appropriate use. The chickpea and pumpkin soup was, sadly, a disappointment. I roasted pumpkin and made purée for the first time last Fall. To be honest, I’d forgotten all about it until I read your post. I think it’s time to pull some of it out and put it to use! Thanks for the reminder and inspiration. I cannot wait to see how you use yours, Sally. I’m sure it will be delicious! HA! So you have a few of those containers in the freezer, right? 🙂 Time to bring them out to play… just make sure to blog about it so I can get inspired too…. 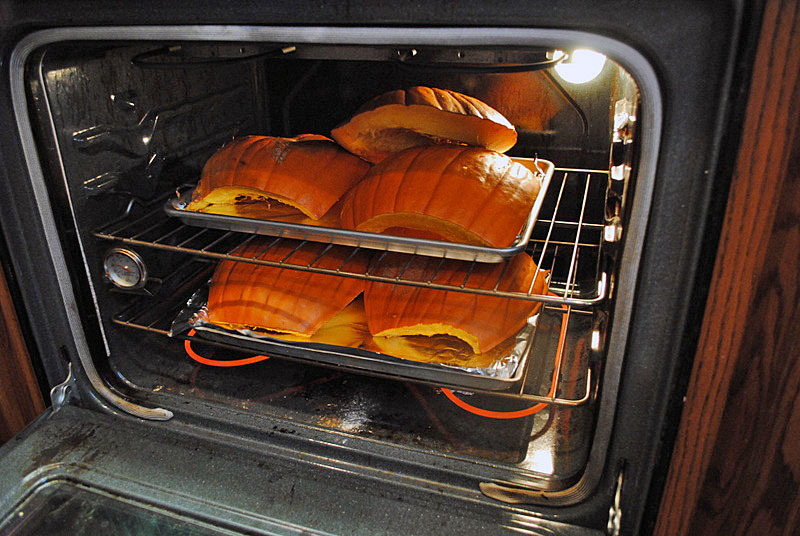 Uncanned pumpkin is how we do it at our house too, for the exact same reasons as you! Samies! This is on my “must-do” list for 2013. I’m sure it makes such a difference in recipes. Thank you for sharing! I hope you are having a lovely week! I love when there is a family history of doing something the ‘real’ way. It makes it meaningful and frankly, once you’ve tasted the authentic stuff and know what it has the potential to be, it’s hard to go back. Thank you for sharing the method and tips with us – this does sound worth the extra effort! Looking forward to your other unplugged pumpkin recipes Sally ;-). We did a lot of cooking together during the holidays and it’s so much fun! It’s so hard to find pumpkins that big around here which is why I rarely make my own puree! Maybe I just need to head out to a farm next fall to pick some up! Great idea. I am just giggling about the freezer turning into an unknown and mysterious universe! That defines my freezer. 😉 I loved this post Sally. You made this process seem so manageable. I love the step-by-step photos. Now I’m going to have to look into getting a potato ricer. Don’t have one of those. Very clever. I haven’t seen pumpkin in the stores in a while though. It’s a shame, because I’ve been missing it. Pass along my thanks to Phil and his family for the recipe too. The potato ricer is a very useful gadget, ours has three disks with different sizes of holes, and I end up using only the middle one all the time. 🙂 I used to have a fancy food mill, those that you turn around. It did not “make the cut’ and was donated during our move. Smaller kitchen, not much storage, you see how it goes. How fun to be reminded of how my parents used to grow pumpkins and make their own puree. Here in Ohio grocers and farm markets sell medium sized pumpkins that are very heavy for their size and are called pie pumpkins. Maybe we will experiment and give this a try next autumn.